Fig. 1. Schematics of the OTTLE cell and of a representative data set obtained by spectroelectro-chemistry during the reduction of Hb Ao, showing an increase in the absorbance at 430 nm in conjunction with a decrease in the absorbance at 406 nm. electrode by capillary action. 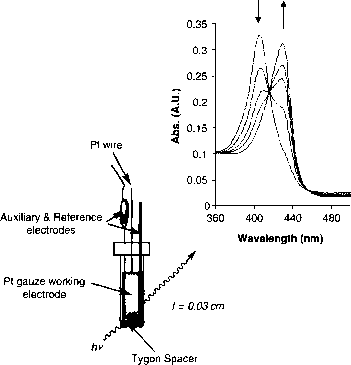 The auxiliary, reference, and working electrodes are connected to each other through the working solution added in excess (~0.3 ml) at the bottom of the cuvette. The OTTLE cell can be purged with N2 for anaerobic measurement before injecting the protein solution. The use of an OTTLE cell such as described here has the following advantages. 1. Solution volumes are small (~450 /¿l), leading to rapid electrolysis and attainment of equilibrium at each applied potential. This is particularly important in protein electrochemistry, where only limited sample quantities are available, and time-dependent protein denaturation is an issue. 2. Anaerobic conditions are more easily achieved. 3. The use of a minigrid in a thin layer of working solution decreases the level of the ohmic drop associated with the electrochemical cell. Protein electrochemistry is made difficult by a number of factors. 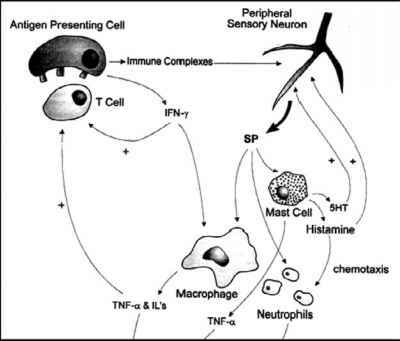 Most proteins are relatively sluggish compared with small molecules with regard to electron transfer. Moreover, proteins are prone to denaturation on contact with the electrode surface, which can change their redox potential. To increase the electron transfer yield and therefore decrease the time necessary to achieve equilibrium, an electron shuttle is used.83 This electron shuttle, also called a mediator, consists of an electro-active species that exhibits ideal reversible redox behavior. Its redox potential (£1/2) needs to be in the general region of the expected £1/2 of the protein being studied. The electron transfers, both homogeneous (between the protein and the mediator) and heterogeneous (between the mediator and the bare electrode), must be extremely fast in order to allow a rapid turnover of the reduced and oxidized forms of the mediator.68'83 The main characteristics of a good mediator for this type of study are as follows. 1. Kinetic characteristics include rapid reversible electron transfer with the electrode and with the protein to avoid being the limiting factor during the redox process. 2. Thermodynamic considerations require that a sufficient amount of the oxidized and reduced forms of the mediator be present in solution at all times.